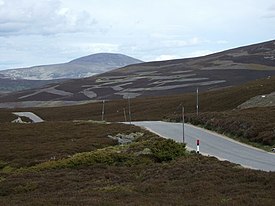 Aberdeenshire (Scottish Gaelic: Siorrachd Obar Dheathain, Scots: Aiberdeenshire) is one of the 32 unitary council areas in Scotland and a lieutenancy area. The present day Aberdeenshire council area does not include the City of Aberdeen, now a separate council area, from which its name derives. Together, the modern council area and the city formed historic Aberdeenshire - one of the counties of Scotland formerly used for local government purposes. Within these borders, the County of Aberdeen remains in existence as a registration county. Aberdeenshire Council is headquartered at Woodhill House, in Aberdeen; the only Scottish council whose headquarters are based outwith its area's border. Aberdeenshire borders Angus and Perth and Kinross to the south, and Highland and Moray to the west. Aberdeenshire has a rich prehistoric and historic heritage. It is the locus of a large number of Neolithic and Bronze Age archaeological sites, including Longman Hill, Kempstone Hill, Catto Long Barrow and Cairn Lee. Since medieval times there have been a number of crossings of the Mounth (a spur of mountainous land that extends from the higher inland range to the North Sea slightly north of Stonehaven) through present day Aberdeenshire from the Scottish Lowlands to the Highlands. Some of the most well known and historically important trackways are the Causey Mounth and Elsick Mounth. The present council area is named after the historic county of Aberdeen, which had different boundaries and was abolished in 1975 under the Local Government (Scotland) Act 1973. It was replaced by Grampian Regional Council and five district councils: Banff and Buchan, Gordon, Kincardine and Deeside, Moray and the City of Aberdeen. Local government functions were shared between the two levels. In 1996, under the Local Government etc (Scotland) Act 1994, the Banff and Buchan district, Gordon district and Kincardine and Deeside district were merged to form the present Aberdeenshire council area, with the other two districts becoming autonomous council areas. Ythan Estuary nature preserve, with tern colonies and dunes in background. The Council's net expenditure is £750.1m a year (2008/09). Education takes the largest share of expenditure (55%), followed by Social Work and Housing (19%), Transportation and Infrastructure (11%), and Joint Services such as Fire and Police (10%). 22% of revenue is raised locally through the Council Tax. Average Band D Council Tax is the eighth lowest in mainland Scotland at £966 (2003/04). The current Chief Executive of the Council is Colin Mackenzie and the elected Head of the Council is Anne Robertson. There are numerous rivers and burns in Aberdeenshire, including Cowie Water, Carron Water, Burn of Muchalls, River Dee, River Don, River Ury, River Ythan, Water of Feugh, Burn of Myrehouse, Laeca Burn and Luther Water. Numerous bays and estuaries are found along the seacoast of Aberdeenshire, including Banff Bay, Ythan Estuary, Stonehaven Bay and Thornyhive Bay. Summers are mild and winters are typically cold in Aberdeenshire; Coastal temperatures are moderated by the North Sea such that coastal areas are typically cooler in the summer and warmer in winter than inland locations. Coastal areas are also subject to haar, or coastal fog. Alexander Garden, (1730–1791), born in Birse, noted naturalist and physician. He moved to North America in 1754, and discovered two species of lizards. He was a Loyalist during the American Revolutionary War, which led to the confiscation of his property and his banishment in 1782. The gardenia flower is named in his honor. John Kemp, (1763–1812), born in Auchlossan, was a noted educator at Columbia University who is said to have influenced DeWitt Clinton's opinions and policies. Hugh Mercer, (1726–1777), born in the manse of Pitsligo Kirk, near Rosehearty, brigadier general of the Continental Army during the American Revolution. John Skinner, (1721–1807) author, poet and ecclesiastic. Penned the famous verse, Tullochgorum. Peter Nicol, MBE, born in Inverurie on April 5, 1973, is a former professional squash player who represented first Scotland and then England in international squash. Dame Evelyn Glennie, DBE, born and raised in Ellon on July 19, 1965, is a virtuoso percussionist, and the first full-time solo percussionist in 20th-century western society. She is very highly regarded in the Scottish musical community, and has proven that her profound deafness does not inhibit her musical talent or day-to-day life. ^ The Megalithic Portal and Megalith Map. "C.Michael Hogan, ''Elsick Mounth'', Megalithic Portal, ed. Andy Burnham". Megalithic.co.uk. http://www.megalithic.co.uk/article.php?sid=18037. Retrieved 2011-07-06. ^ a b "Aberdeenshire Council" (PDF). http://www.aberdeenshire.gov.uk/statistics/area/AberdeenshireProfile2010.pdf. Retrieved 2011-07-06. ^ "Aberdeenshire Council" (PDF). http://www.aberdeenshire.gov.uk/statistics/area/PeterheadProfile2010.PDF. Retrieved 2011-07-06. ^ "Aberdeenshire Council" (PDF). http://www.aberdeenshire.gov.uk/statistics/area/InverurieProfile2010.PDF. Retrieved 2011-07-06. ^ "Aberdeenshire Council" (PDF). http://www.aberdeenshire.gov.uk/statistics/area/FraserburghProfile2010.PDF. Retrieved 2011-07-06. ^ "Aberdeenshire Council" (PDF). http://www.aberdeenshire.gov.uk/statistics/area/WesthillProfile2010.pdf. Retrieved 2011-07-06. ^ "Aberdeenshire Council" (PDF). http://www.aberdeenshire.gov.uk/statistics/area/StonehavenProfile2010.PDF. Retrieved 2011-07-06. ^ "Aberdeenshire Council" (PDF). http://www.aberdeenshire.gov.uk/statistics/area/EllonProfile2010.PDF. Retrieved 2011-07-06. ^ "Aberdeenshire Council" (PDF). http://www.aberdeenshire.gov.uk/statistics/area/PortlethenProfile2010.PDF. Retrieved 2011-07-06. ^ "Aberdeenshire Council" (PDF). http://www.aberdeenshire.gov.uk/statistics/area/BanchoryProfile2010.PDF. Retrieved 2011-07-06. ^ "Aberdeenshire Council" (PDF). http://www.aberdeenshire.gov.uk/statistics/area/TurriffProfile2010.PDF. Retrieved 2011-07-06. ^ "Aberdeenshire Council" (PDF). http://www.aberdeenshire.gov.uk/statistics/area/HuntlyProfile2010.PDF. Retrieved 2011-07-06. ^ "Aberdeenshire Council" (PDF). http://www.aberdeenshire.gov.uk/statistics/area/BanffProfile2010.PDF. Retrieved 2011-07-06. ^ "Aberdeenshire Council" (PDF). http://www.aberdeenshire.gov.uk/statistics/area/MacduffProfile2010.PDF. Retrieved 2011-07-06. ^ "Aberdeenshire Council Results". http://www.aberdeenshire.gov.uk/elections/local/index.asp. Retrieved 2007-05-06. ^ a b c Who Was Who in America, Historical Volume, 1607-1896. Chicago: Marquis Who's Who. 1963. This page uses content from the English language Wikipedia. The original content was at Aberdeenshire. The list of authors can be seen in the page history. As with this Familypedia wiki, the content of Wikipedia is available under the Creative Commons License.